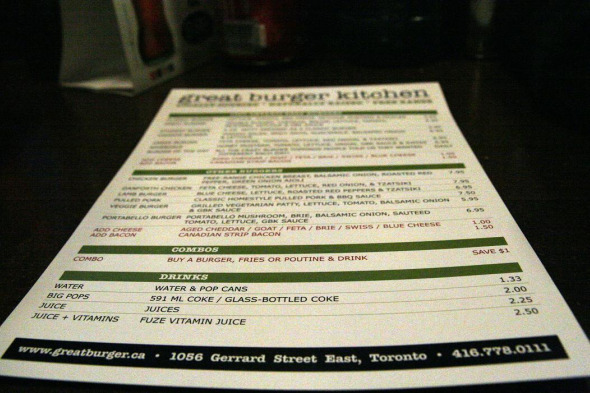 The Great Burger Kitchen adds another notch to Toronto's bulging burger belt. Launched three weeks ago by The Wine Bar's Ted Koutsogiannopoulos and Jim Gontis of Johnny G's, this labour of meaty love serves naturally raised beef and locally sourced produce in north Leslieville . 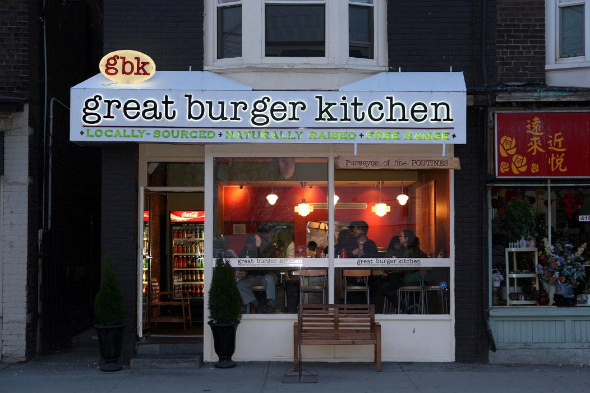 Sitting on a somewhat desolate stretch of Gerrard, GBK's location doesn't seem like the best place to launch a gourmet burger joint, but when I stop by the place is packed, so perhaps it's true that "if you build it, they will come." With seating at a minimum, stark decor and KiSS FM on the box, the place is more geared for to-go than eat-in. 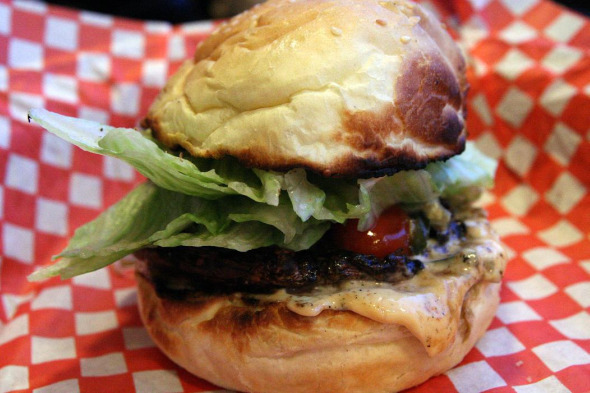 A comprehensive menu boasts 100% Ontario beef burgers, "other" burgers (chicken, lamb and veggie) plus eight types of poutine. 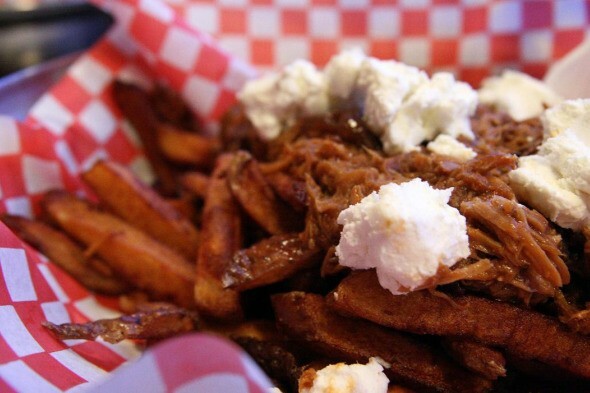 All the regular bases are covered with a few compelling additions like the pulled pork burger ($7.50) and Greek poutine (feta, tomato, lemon oregano dressing, $5.95) as well as the usual sides of fries, salad and onion rings. Pop, water and juice complete the beverage list. I stick to the basics and go with the classic burger (Ontario beef, lettuce, tomato, red onion, ketchup, mustard and pickles, $5.95). Slapping on brie, some bacon and making it a combo brings my bill to just under $15.00 -- a little more than I'm used to shelling out, but the promise of blue-ribbon beef is too alluring to pass up. Considering how busy it is, the meal doesn't take long to arrive, and for a place only three weeks old, the operation seems well-oiled (despite some initial confusion over cheese preferences and the presence of a large onion ring among the straws). My burger's served in a retro steel tray and surrounded by a mound of glistening fries. I like the size of the patty and the sight of bacon, pickles and lettuce groaning from the sides. Tucking into the freshly toasted bun (organic, from the Brick St. Bakery) I hit the gutsy bacon, crisp iceberg and creamy brie. But all that's forgotten when I reach the mighty patty. Smoky, juicy and most of all meaty, the sheer "beefy-ness" of the thing wows me. Coupled with the hand-cut, double-cooked Yukon fries, this is comfort food at its best. If I have one beef (sorry), it's that the patty is so brazen it smothers some of the other ingredients. Still, making the choice between more beef or more lettuce is really not much of a decision. My burger buddy has opted for the portobello burger (portobello, brie, balsamic onion, sautĂŠed tomato, lettuce, GBK sauce $6.95) with a side of pulled pork poutine. Though technically a side, the heaving poutine requires its own tray and could easily feed two. Lucky I'm hungry and offer to help out. The portobello is rich and fleshy, topped with melted brie that gives a sharp note to the more neutral flavors. Too bad the mushroom is on the smallish side -- halfway through the bun it's all gone. Still, t'was fun while it lasted. The poutine aspires to greatness but never rises above the sum of its parts. Certainly the sweet and saucy pulled pork is excellent and, teamed with the goat cheese, a thing of beauty. But heaped over the fries it's all a bit much. These flavors and textures don't lend themselves to one another, with the spuds and cheese conspiring to make everything a little dry. Still, a valiant effort -- though next time I'll try the pulled pork burger. So while the Great Burger Kitchen is a little pricey, my pal and I leave feeling we've got a lot of bang for our buck. The quality and quantity of its product make GBK a welcome addition to Toronto's burger circuit.